The Netherlandish Proverbs, or the Blue Cloak as it is sometimes called, includes visual representations of perhaps more than 90 individual proverbs. The precise number of proverbs remains somewhat uncertain because modern scholarly interpretations vary and, in some case, more than one proverb might be assigned to the same component in the painting. Proverbs were well-known to the people of 16th-century Flanders. For example, a contemporary of Bruegel, Frans Hogenberg, produced an engraving around 1558 illustrating some 40 proverbs. In this program, a selection of proverbs is identified to provide you with a starting point to a better understanding of Bruegel’s painting. 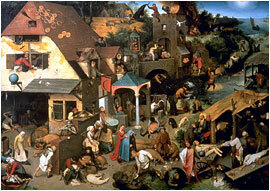 The identification of the proverbs in Bruegel’s painting is based on Gustav Gluck, Peter Brueghel the Elder, New York, 1936; Walter Gibson, Bruegel, London, 1977; Mark A. Meadow, Pieter Bruegel the Elder’s Netherlandish Proverbs and the Practice of Rhetoric, Zwolle, 2002.